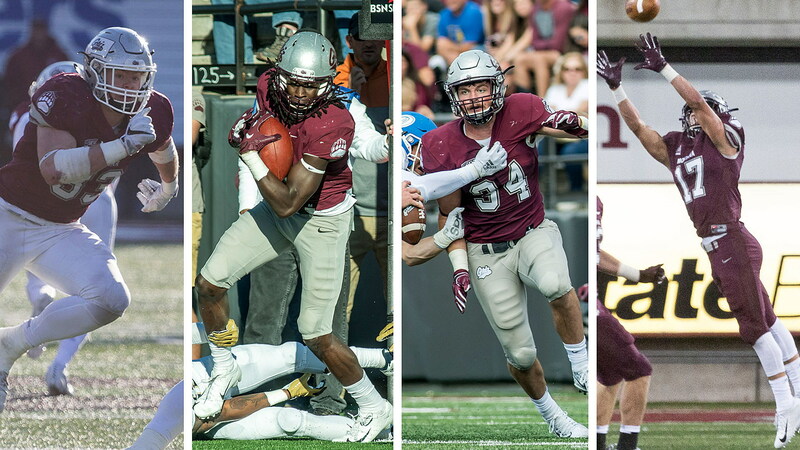 Montana junior linebacker Dante Olson has picked up his third First-Team All-America award in the past week, and three other Grizzlies have also been named All-Americans in a trio of releases on Monday and Tuesday. Olson was named to the 2018 STATS FCS All-America Defensive First-Team, the only defensive player in the Big Sky Conference to earn First-Team honors. Online FCS news outlet HERO Sports also named Jace Lewis and Samuel Akem to its sophomore First-Team All-America list on Tuesday, and Robby Hauck earned a place on its freshman First-Team All-America list as well. STATS will also honor Olson in January as a top-three finalist for the Buck Buchanan Award, presented annually to the FCS Defensive Player of the Year on the eve of the National Championship game in Frisco, Texas. In the last week, the national leader in tackles during the regular season also earned First-Team All-America honors from the Associated Press and the Walter Camp Foundation. Akem earned second-team All-Big Sky honors after a breakout season hauling in 13 touchdown catches – the sixth-most touchdown in the nation, and the most in the league. The prolific sophomore caught at least one touchdown pass in eight games, and two TD grabs in five games. Montana’s leading receiver with a Grizzly top-20 total of 863 yards, Akem’s 13 TD catches is the fifth-most in a single season in Grizzly history, tied with legends like Marc Mariani, Marvin Turk, and Mike Rice. Lewis was named to the HERO Sports First-Team special teams list after earning All-Big Sky second-team honors in 2018. As Montana’s top special teams contributor, he was a key part of UM’s Big Sky-best kickoff coverage unit with 62 tackles on the season, ranking in the league’s top-40. Hauck was the national leader in tackles for a freshman and was No. 3 in the voting for the Jerry Rice Award for the top freshman in the nation. He received an All-Big Sky honorable mention as UM’s second-leading tackler, finishing the year with 95 total takedowns (41 solo, 54 assisted), the fifth-most in the conference and the most of any freshman, and was the only freshman among the Big Sky’s top-30 tacklers. Hauck posted four games with double-digit tackle totals, including a career-high 17 in Montana’s win at Cal Poly. *-Order of quarterbacks to be determined after the STATS FCS Awards Banquet on Jan. 4. DL Jordan Lewis Southern U.